Obesity is one of the more common lifestyle-related diseases. Obesity is a condition in which excess body fat is accumulated to an extend where it can have an adverse effect on health. One is considered obese when their BMI, or Body Mass Index (obtained by dividing a person’s weight in kilogrammes by the square of a person’s height in metres) exceeds 30kg/m2. Common in males and menopausal females. This form of obesity is around the abdomen. Person affected are more susceptible to myocardial infarction (heart attack) and diabetes. Also known as the lower body obesity, the areas affected are around the buttocks and hips. A type common in women, it is not much of a serious health issue. 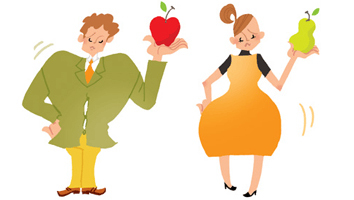 What’s wrong with being overweight? Basal Metabolism Rate is the rate at which energy is expended daily while the body is at rest, and reduces towards middle age. Because energy is not used when you do not exercise, the sugar and calories that you consume from food gets stored in the body in the form of fat. Subcutaneous fat, or fat under the skin does not pose much of a problem. But hyperlipidemia, or high fat content in the blood is much more serious, and can cause high blood pressure, bad cholesterol, diabetes, stroke or heart attacks. To find out if you are classified as obese, check your Body Mass Index or BMI. Your BMI is in the Low Risk category for cardiovascular diseases and type 2 diabetes. However, your weight is in the unhealthy range for your height as you are at an increased risk of nutritional deficiencies and osteoporosis. Increase your BMI value to within 18.5 to 22.9 to stay healthy. Your BMI is in the Low Risk category. Your weight is in the healthy range for your height. Maintain your BMI value within 18.5 to 22.9 to stay healthy. Your BMI is in the Moderate Risk category. Your weight is in the unhealthy range for your height. You are at moderate risk of developing cardiovascular diseases (such as heart attack) and diabetes. Keep your BMI value within 18.5 to 22.9 to reduce your risk of developing these diseases. Your BMI is in the High Risk category. Your weight is in the very unhealthy range for your height. You are at high risk of developing cardiovascular diseases (such as heart attack) and diabetes. Keep your BMI value within 18.5 to 22.9 to reduce your risk of developing these diseases. The Body Fat Percentage is the total mass of fat divided by the total body mass. Body fat includes essential body fat and storage body fat. Essential body fat is necessary to maintain life and reproductive functions. Storage body fat consists of fat accumulation in adipose tissue, part of which protects internal organs in the chest and abdomen. 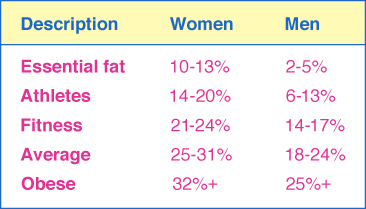 There are several ways to measure Body Fat Percentage, check with your doctor. For an obese person to return to the normal values of blood sugar and cholesterol, neutral fat is important. First, reduce the intake of animal fats and oil, meats and salt. Switch to a more vegetable-based diet. Stop all between-meal snacking and supper, moderate your alcohol consumption as well. 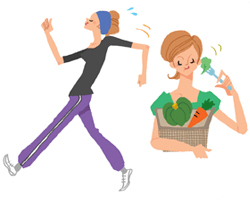 Do the 10,000-steps-per-day walk, lower body fat percentage along with building muscles with regular exercise.